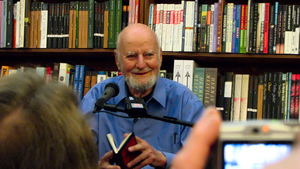 Lawrence Ferlinghetti, poet, publisher, activist, and painter will turn 100 on March 24. To celebrate that significant milestone in a long and varied life, Ferlinghetti's famous San Francisco bookshop City Lights will be hosting a birthday party open to the public. Everyone is welcome at City Lights (261 Columbus Avenue) between 1:00 and 5:00 on Sunday, March 24, to honor the life of Ferlinghetti, who is perhaps best known for first publishing Alan Ginsburg's classic Beat poem Howl in 1956. Ferlinghetti was subsequently arrested for that act, which in turn led to a lengthy trial around the First Amendment. City Lights, which was co-founded by Ferlinghetti in 1953, will host a variety of Bay Area writers and artists at the birthday celebration who will read selections from Ferlinghetti's poetry. Photos and video screenings from his life will also be on display during what the mayor of San Francisco has officially declared to be "Lawrence Ferlinghetti Day."